This week has been all about trying to keep things simple, both at home and in the studio. With just the two of us making everything, running the business, and doing all the things at home to keep our house and family running, it can be really hard to stay productive, energetic and focussed. And calm. It’s really all about keeping things simple and organised. It’s so tempting to take too much on and to try and achieve everything all at the same time. But this often means rushing your work and having super long hours. We work long hours anyway, but rushing ceramics is never a good idea. I’m a big believer in creating achievable targets, and setting boundaries, taking time to do each task well - this often means saying no and turning down work. Which let’s face it, is easier said than done. So how can you flip the situation round, so that the fact your work is slow, is positive, rather than negative? I think for me it’s about communication. I love sharing process images on Instagram because it shines light on our craft, the details and how our time is spent making. Elevating the fact that we don’t make mass-produced pieces means that most often our customer is educated in our craft, they are prepared to wait for our pieces and are just generally engaged in our process - it’s a pretty great tool. Don’t be apologetic about your lead times - just be honest. This week I’ve discovered an app called Trello via another maker’s instagram stories (the queen of slow weaving, Christabel Balfour), and I’m already pretty sold on it. It’s essentially a way of creating collaborative lists and it’s perfect for me and Matt to share the many diverse tasks it takes to run our studio. You can set multiple lists for any projects with deadlines, attachments and notifications to keep you on the same page. I rarely spend any time alone these days - the studio is a busy place and when I’m at home my little boy wants to be as close as possible. I love it but I also need some space to think, to enable me to be creative. I don’t think I’m very good at carving out this time for myself, neither is Matt, but we do try and make sure we get outdoors for long walks with our dog Nella at weekends (pictured below) which is such a tonic. You also don’t need a lot of time - it can be more of a gesture. This week I’ve been really enjoying the Instagram posts by The Broadplace - just offering up some great thoughts and notions for balance and creative energy. Podcasts are great too, just to alter the tangent of your thinking and provoke some new perspectives. If you have any good ones you can recommend, please let me know in the comments below. Ahead of each week, usually a Sunday afternoon, Matt and I run through our throwing and making schedule for the week ahead. We discuss deadlines and set down things we’d like to achieve in the week ahead. I think the action of putting these thoughts into words helps them to become an actuality. Having a certain day in the week to do admin tasks, such as invoices, scheduling social media posts (I have never managed to do this yet! ), is something which really helps. Checking your phone for emails and messages only at certain points of the day helps prevent disruption when you’re trying to make. Often you don’t acknowledge how long tasks really take and so you don’t allocate enough time. Keep a timesheet and look back on how you’ve spent your week in the first instance, and then plan your week from there. Know that social media is a window into most people’s very best life, and not always a reality. I have been trying to limit myself to how long I spend on social media, partly for this reason, because sometimes it makes me feel envious as opposed to supportive and excited for other people - which is such a waste of energy, and isn’t really true to my nature. Also, a good tip is that if you are finding posts by a particular person to make you feel like this, why not just mute these posts for a while? It’s your choice and it’s only temporary. 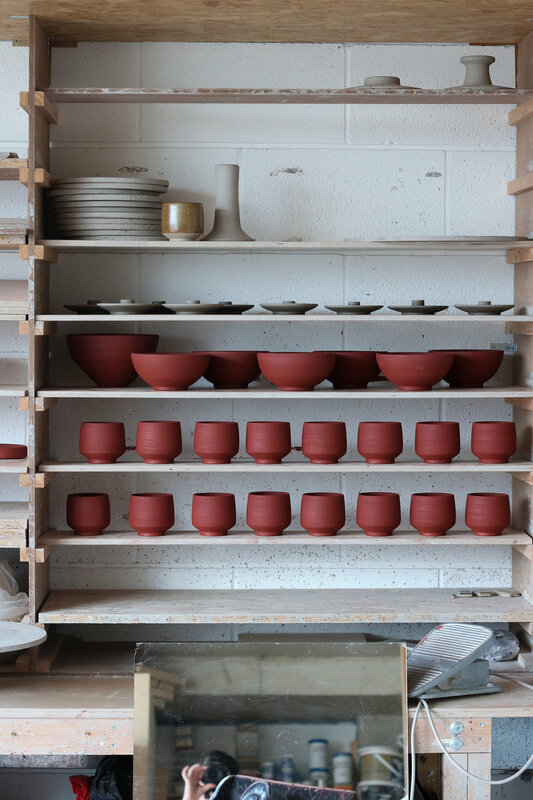 Pictured above are some of our pieces in porcelain, glazed in a simple wood ash glaze. They are time consuming to make, although they are simple in material composition. But I really love the calm and subtle nature of the finished pieces. If you have any good tips and tricks, please do share them in the comments below.